Beautiful wood deck with decorative sunburst railing design. 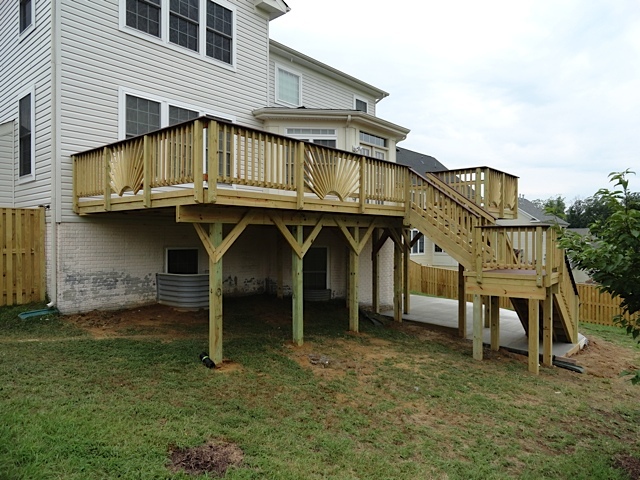 Wood deck stairs with composite deck boards for stair treads. Traditional wooden deck with stairs landing on patio. A wood deck with an elaborate staircase and screened porch makes both a spectacular home addition and a great place to relax. This wood deck has a starburst fence. A dark wood deck links this home with the lawn below. A wood deck decorated with flower boxes and hanging baskets. A painted wood deck looks pretty on the back of a brick house. An attractive wood deck with decorative features.